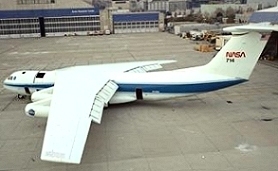 The Kuiper Airborne Observatory (KAO) is a 0.915-meter reflecting telescope mounted in a Lockheed C141A Starlifter jet transport aircraft and flown at altitudes of up to 13.7 kilometers. Named after the Dutch-American astronomer Gerard Kuiper, it was based at the Ames Research Center and operated as a national facility by NASA from 1975–95. Among its discoveries were the ring system of Uranus. The KAO has now been replaced by SOFIA (Stratospheric Observatory for Infrared Astronomy).